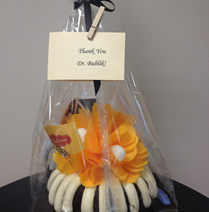 "Dear Dr. Bublik, I cannot tell you how happy I am with how my lip turned out! Thank you for making a difficult experience for me easy going." 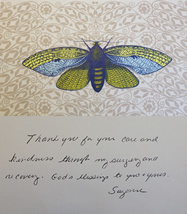 "Thank you for your care and kindness through my surgery and recovery. God's blessings to you." "Dr. Bublik, Thank you for everything you have done for me and my family. 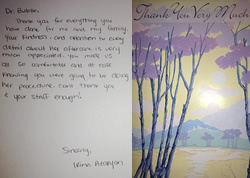 Your kindness and attention to every detail about her aftercare is very much appreciated. You made us all so comfortable and at ease knowing you were going to be doing her procedure. Can't thank you and your staff enough. I.A." 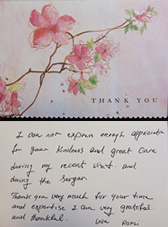 "I can not express enough appreciation for your kindness and great care during my recent visit and during the surgery. Thank you very much for your time and expertise, I am very grateful and thankful." "Thank you for making my surgery a life-changing experience. You have exceeded my expectations and been more than helpful. 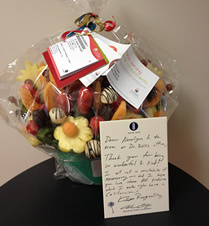 I am delighted with my results and want to wish Dr. Bublik, Anna and the rest of the office staff happy holiday!" "I made an appointment to see Dr. Bublik for two reasons. Firstly, and most importantly, I was having difficulty breathing through my nose, particularly on one side. Secondly, I was slightly unhappy with the appearance of my nose as a result of a sports-related trauma several years ago. Within a matter of minutes of my first appointment, Dr. Bublik was able to identify the cause of my breathing problems. A large deviation in my septum significantly reduced the air intake through my nose and, in addition, I suffered from allergies. Dr. Bublik clearly explained the various options for treatment, as well as the pros and cons of each. I opted to for surgery as, in my situation, it likely would provide the greatest long-term benefit. Separately, Dr. Bublik also explained how the overall appearance of my nose could be enhanced with some minor refinements. As a young male, I was a little concerned with the social implications of getting a "nose job", however Dr. Bublik assured me that not only is male rhinoplasty one of the fastest growing areas in plastics, but that the procedure will result in very subtle changes that nobody would notice. Dr. Bublik was absolutely right - nobody noticed. To me, the change was clear but to friends and family it went unnoticed, which is exactly what I wanted. 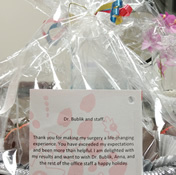 The post-op appointments were excellent; the level of care and advice Dr. Bublik provided was exceptional. Overall, I'm really happy with the results and would highly recommend Dr. Bublik to others." "After suffering for several years with tonsilitis, our 15years old daughter, was referred to Dr Bublik. Her tonsils had been ulcerated and hypertrophic, to the the point that they almost touch each other, causing her difficulty to swallow and breathe properly. Dr Bublik recommended immediate surgery which was performed on May 3, 2012. He amazed us with his caring attitude, and how well he communicated with our daughter, to make her feel confident that everything was going to be fine. He called home next day after surgery to make sure she was doing good. She recovered very well, and in every follow up appointment, Dr Bublik was always answering our daughter's questions in a clear and pleasant way. Our 19 years old son had a deviated septum. His left nare was almost occluded and he was having difficult breathing while exercising, as well as while sleeping. When, finally, his primary doctor stated he needed to referred him to the ENT specialist, we requested to have Dr Bublik. Once again, Dr Bublik did a great job while explaining the whole process of surgery.Our son has always been very afraid of any medical procedure. The day surgery was performed, August 6, 2013, he came out of surgery giving us two thumbs up!. Next morning, Dr Bublik saw him, at his office, to reassure him everything was fine. A week later, his nasal cast was removed and watching our son smiling face was priceless! We want to thank Dr Bublik for his medical arts skills but above all for his great demeanor and people skills! It certainly made a great difference in our children outcomes! Our children mentioned that Dr Bublik exceeds all standards when compare to all Doctors they have been referred to before!" "Dr. Bublik is an incredible doctor. I have chronic sinusitis and Dr. Bublik was able to completely clear my infection up through a minor in-office procedure. Since the procedure I have felt no sinus pressure, had no congestion, and no infections. His bedside manner is impeccable and I always felt comfortable, never nervous. I highly recommend Dr. Bublik for any sinus issues." "I found Dr. Bublik in 2012 when I called my insurance company looking for an ENT doctor in my area. When I first met Dr. Bublik I noticed his calm demeanor and complete attention to my medical needs. I've had a few procedures performed by him including a surgery which needed to be schedule immediately due to personal reasons. His office staff made all the necessary arrangements extremely promptly. Dr. Bublik is a true medical professional and his love for his profession shows through his quality of work and excellent patient care. Thank you Dr. Bublik for your outstanding care and attention to detail to my medical treatment. I will continue putting my health in your hands and without a doubt highly recommend you to family and friends." "Sinoplasty changed my life. I used to suffer from constant sinus congestion and frequent sinus infections with massive headaches. My MD referred me to Dr. Bublik who was getting great results with a new procedure called Balloon Sinoplasty. Dr. Bublik examination indicated I was indeed a good candidate for the procedure and "Wow, or should I say OMG!" I can now breath better than I have my entire life. Clear, unobstructed air flow in both nostrils, all day and all night and waking up in the morning refreshed. I can not say enough about the improvement in the quality of my life as result of the procedures performed by Dr. Bublik. Not only that, but you will find him personable and sincerely interested in helping his patients. Thanks again, You made it to the top of my favorite doctors list!" "Best results ever! Wow, you were not kidding when you stated: "Experience The Difference" I Love you Dr. Bublik! You are perfect in every way." Thank You! "Dr. Bublik without a doubt is wonderful. Very caring and gentle - Great bedside manner." "I have been battling sinus problems for many years and Dr. Bublik is the first doctor that has managed to get things under control. His office staff is really efficient and friendly - office visits are a pleasure." "Wonderful, human and knowledgeable. Dr. Bublik took his time, I believe I was there for more than an hour! I had a couple of issues to discuss with him and he never seemed to be in a hurry. He never discussed the issue of possible surgery for my nasal/sinus problems, which I found a welcoming relief.I strongly recommend him." "You can’t find a more knowledgeable, skillful, compassionate and attentive physician than Dr.Bublik. From the very first meeting he answered all my question, and concerns. He mapped out the whole course of treatment, the surgery, post-surgery and the outcome. He answered every question with honesty. He provided his email for any additional questions or concerns that I may have forgotten to ask at the office and he responded quickly with a reply. After the surgical procedure, he called me each day to check my progress and to make sure that I was comfortable in my recovery. The surgery was successful and changes have been remarkably good. Co-workers have commented that, “I have never looked so good!”.